Goodyear Autocare, Mechanics Tweed Heads, provide a wide range of mechanical and automortive services to Tweed Heads and the surrounding area, including mechanical services, tyre replacement, wheel alignment, suspension, batteries and steering. Goodyear Autocare, Mechanics Tweed Heads, have over 18 years experience working with cars and servicing clients within the Tweed Heads area. From batteries to mechanical repairs, Goodyear Autocare have the expertise to assist you with all your mechanical requirements. At Goodyear Autocare, Mechanics Tweed Heads, our focus is delivering a high quality service at a competitive price to all our clients, and no job is too big or small. If you are looking for a professional and reliable mechanical service at an affordable price, give Goodyear Autocare - Mechanics Tweed Heads a call today. 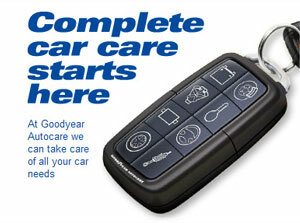 At Goodyear Autocare we can take care of all your vehicles engine and driveline requirements. Regular engine and driveline maintenance is not adhered to, poor performance, poor fuel economy and the potential for engine and driveline repairs can be expected. The environment will also suffer due to increased harmful exhaust emissions. Your engine needs to be properly maintained by trained professionals to keep it running trouble free. There are many areas of the engine that require proper lubrication, adjustments and servicing to keep it performing reliably. Call 13 23 43 today to speak to your local Goodyear Autocare who can offer you a range of service options that will protect your engine, ensuring that all day, every day "we'll keep you running". The Tweed Community Guide is your online guide to the Area of Tweed . The Area of Tweed is located in Richmond Tweed, New South Wales, Australia and includes the local suburbs of Back Creek, Banora Gardens, Banora Point, Barneys Point, Bilambil, Bilambil Heights, Bilambil Upper, Bogangar, Bray Park, Brays Creek, Bungalora, Burringbar, Byangum, Byrrill Creek, Cabarita, Cabarita Beach, Carool, Casuarina, Cedar Creek, Chillingham, Chinderah, Chowan Creek, Clothiers Creek, Cobaki, Cobaki Lakes, Commissioners Creek, Condong, Crabbes Creek, Crookes Valley, Crystal Creek, Cudgen, Cudgera, Cudgera Creek, Dallis Park, Dodds Island, Doon Doon, Dulguigan, Dum Dum, Dunbible, Dunbible Creek, Dungay, Dungay Upper, Duranbah, Duroby, Duroby Creek, Eungella, Eviron, Farrants Hill, Fernvale, Fingal, Fingal Head, Glen Warning, Glengarrie, Greenbank Island, Hastings Point, Hopkins Creek, Kielvale, Kings Forest, Kingscliff, Kunghur, Kunghur Creek, Kynnumboon, Limpinwood, Lower Cudgera, Mebbin, Middle Burringbar, Midginbil, Mooball, Mooball Beach, Mount Burrell, Mount Warning, Murwillumbah, Murwillumbah South, Nobbys Creek, Norries Head, North Arm, North Tumbulgum, Numinbah, Nunderi, Ophir Glen, Oxley Cove, Palmvale, Piggabeen, Pottsville, Pottsville Beach, Pottsville Waters, Pumpenbil, Quarry Hill, Reserve Creek, Round Mountain, Rowlands Creek, Sexton Hill, Sleepy Hollow, Smiths Creek, Stokers Siding, Stotts Creek, Tanglewood, Terragon, Terranora, Tomewin, Tumbulgum, Tweed Heads, Tweed Heads South, Tweed Heads West, Tweed Heights, Tyalgum, Tyalgum Creek, Tygalgah, Uki, Upper Burringbar, Upper Crystal Creek, Upper Doon Doon, Upper Duroby, Upper Rowlands Creek, Urliup, Wardrop Valley, Wommin Bay, Wooyung, Zara, & surrounding areas.